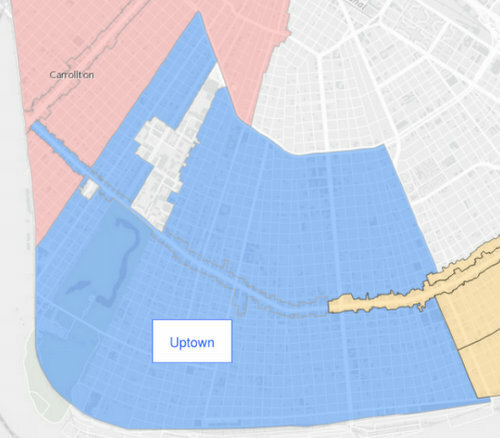 A new oversight structure for historic homes in much of Uptown and Carrollton easily moved forward to the New Orleans City Council for a final decision on Tuesday, after the City Planning Commission swiftly voted in favor of recommendations that have been pending for most of the year. The vast majority of Uptown and Carrollton should fall under the “partial” control of the HDLC, giving the commission scrutiny over demolition requests but nothing else. Property fronting St. Charles or South Carrollton avenues, however, would receive “full” control by the HDLC, so that any changes — demolition, construction or renovations — visible to the public would require HDLC approval. In the full-control areas along St. Charles and South Carrollton avenues, nearly any work a homeowner performed on the exterior of a property — lighting, roofing, siding, or anything other than simple painting — would need a certificate from the HDLC, said the commission’s deputy director, Eleanor Burke. She noted that the St. Charles Avenue neighborhood association had polled their membership, and that all their residents were in favor of the tighter controls. “They were all unanimously in favor of full control, recognizing the significance of the St. Charles Avenue historic corridor,” Burke said. For non-controversial demolition requests in the rest of the neighborhoods, however, the change will actually eliminate the time-consuming step of City Council approval. HDLC decisions are binding unless appealed to the City Council, whereas all NCDAC recommendations had to go to the City Council for a final decision afterward. The City Planning Commission had already examined the proposal last month, and on Tuesday reviewed it again. No one spoke in opposition, and the only comments from the public were from Carol Gniady and Sandra Stokes of the Louisiana Landmarks Commission, urging stronger HDLC regulations within the neighborhoods. City Planning staff members said that the HDLC does not have enough employees to handle the workload that level of review would require, but Stokes said that only meant more staff should be added. With no further comments from the public, the City Planning Commission voted unanimously to send the proposal to the City Council for final approval. A similar proposal for Mid-City and Parkview also passed on Tuesday, according to our sister site Mid-City Messenger. All you need to know is that HDLC is the city political body that does not believe historic monuments in the city should be preserved. Why would anyone entrust it with their historic home or neighborhood? It is ignorant, unprincipled, and servile. All you need to know is that those “historic” monuments were put in place to remind African Americans of “their place” in society. It is ignorant and unprincipled to use public land to prominently memorialize white men who fought to keep an entire race under the scourge of slavery. Even accepting your negative views of those men, a true preservationist would preserve them. That’s what preservationists do. If we had an antique monument to Beelzebub, we should keep it. I know we have a statue of a witch we may keep. “Historic preservation” sounds nice but one needs to take a look at how the HDLC manages the areas already under their control. It’s subjective and inconsistent. Treat yourself and go to one of the Commission meetings to watch a de facto White Men’s Homeowner Association relish telling people the size of their home’s window that someone else installed years ago is now a critical urgency and a violation punishable by fines if not corrected at their own cost.